Although selective serotonin reuptake inhibitors (SSRIs) such as Zoloft are widely prescribed to treat depression, panic disorder, obsessive-compulsive disorder, and post-traumatic stress disorder, a number of serious side effects and risks have come to light involving these medications. Hundreds of lawsuits have already been filed as plaintiffs take action against the makers of SSRI drugs for these dangerous unexpected side effects, but even as litigation is pending, new problems are arising. One new study presented at the annual meeting of the American Society for Bone and Mineral Research demonstrates that the SSRI fracture risk among post-menopausal women exceeds the fracture risk associated with corticosteroids and PPIs. Older women who use SSRI drugs and who suffer a fracture should consider a dangerous drug lawsuit in San Antonio to hold drug makers responsible for injuries. The link between SSRIs and bone fractures has been well established by medical studies. In 2012, researchers published the results on PubMed of their careful review of information from 12 prior studies on SSRI fracture risks. Adjusting for variables and other risk factors, the researchers from the Department of Family Medicine determined that “fracture risk associated with SSRI use may have a significant clinical impact.” Research has also demonstrated an increased risk of falls in dementia patients prescribed SSRI drugs. Seniors with dementia have a lengthy recovery period from bone fractures and may not recover fully from the bone break or associated complications. This past data, however, had not fully identified the magnitude of the effect of SSRIs on bone fractures. The new study attempted to assess just how badly SSRIs affect bone density. The study involved comparing the risk of fractures in patients taking SSRIs versus the risks in patients taking PPIs and corticosteroids. 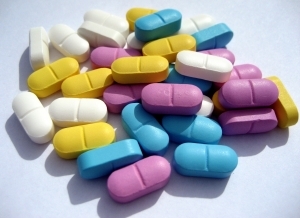 Both PPIs and glucocorticoids are well-known for their strong link to fractures, and researchers believe understanding the relative fracture risk of these medications versus SSRIs is helpful because there are clear guidelines for preventing glucocorticoid-induced osteoporosis but not for SSRI-induced osteoporosis. The study compared incidents of reported fractures over a five year period among women using one of the three drugs: SSRIs, glucocorticoids (GCs) and PPIs. Women aged 55 and up in 10 countries from 615 primary care practices were included in the study. A total of 9,347 of the women had not been treated with SSRIs, GCs or PPIs while 2,715 used PPIs, 5304 used GCs and 1,149 used SSRIs. Researchers found anxiety was the highest in the SSRI patients, and that after five years, SSRIs were the only therapy that showed a significant increase in the risk of overall fractures, nonhip/nonvertebral fractures and clinical spine fractures. This is bad news for patients as the results mean the risk of fractures caused by SSRIs may actually be greater than the risk caused by corticosteroids and PPIs. Patients need to be aware of the magnitude of the risk and should take legal action if they believe the SSRI manufacturer failed to adequately warn them about the dangers associated with SSRI use. If you believe you should pursue a dangerous drugs lawsuit, contact the Herrera Law Firm at 800-455-1054 for a free case consultation.